Iran and the European Union appeared to make progress in resolving outstanding differences on how to implement a landmark nuclear deal in talks in Geneva on Friday but the United States said discussions were not yet finalised. Deputy Foreign Minister Abbas Araqchi met a senior EU official in Geneva to iron out remaining practical details of the November 24 accord under which Iran agreed to curb its most sensitive nuclear work in return for some sanctions relief. After the meeting, he told Reuters that the sides had found “solutions for every difference” but more consultations were needed before an agreement could be announced. “Now we are taking the solutions … home, all of us. Hopefully tomorrow we can either confirm or not, but hopefully confirm,” he said. The European Union liaises with Iran on behalf of six world powers – the United States, Russia, China, France, Britain and Germany – in diplomatic efforts related to Tehran’s nuclear work. A spokesman for the EU, Michael Mann, said “very good” progress was made “on all the pertinent issues”, but added that results of the talks still had to be validated by more senior officials. In Washington, State Department spokeswoman Jen Psaki told a news briefing that the technical talks were making good progress but reports that a deal had been finalised were inaccurate. “There have been a few outstanding issues, but at this point, the reports that everything has been finalised are incorrect,” she said. The seven countries need to agree when the nuclear accord goes into effect, meaning when the European Union and the United States ease economic sanctions in return for Iranian nuclear concessions, and how they will verify that Iran is meeting its end of the bargain. During years of on-and-off diplomacy, Iran has rejected western allegations its work has military goals, saying it needs nuclear power for energy generation and medical purposes. In a series of implementation talks between nuclear experts and sanctions specialists from the seven countries and the EU, held since November 24, several issues linked to the accord have surfaced. There appear to be disagreements over the sequence of how the sides implement the deal, and how much prior notice of Iran fulfilling its obligations should be given to western governments before they ease sanctions. The talks have also run into problems over advanced centrifuge research, highlighting the huge challenges facing Iran and the six powers in negotiating the precise terms of the interim agreement. Diplomats have said the sides aim to start implementing the agreement on January 20, to allow EU foreign ministers, scheduled to meet that day, to approve the suspension of EU sanctions covered by the deal. Preparations for that to take place were under way in Brussels, officials said. 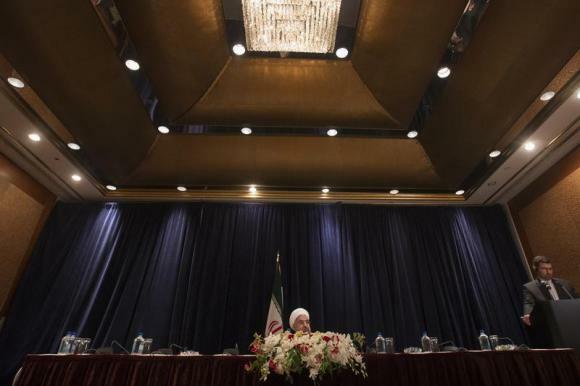 The agreement is designed to last six months and the six powers hope to use the time to negotiate a final, broad settlement over Iran’s nuclear ambitions. Underscoring scepticism about future diplomacy, one western diplomat said progress towards implementation of the November deal was a good sign, but difficulties remained in agreeing a broad accord to settle the decade-old dispute. “It is welcome but we can’t lose sight of fact that it only really represents a cooling-off period,” he said.